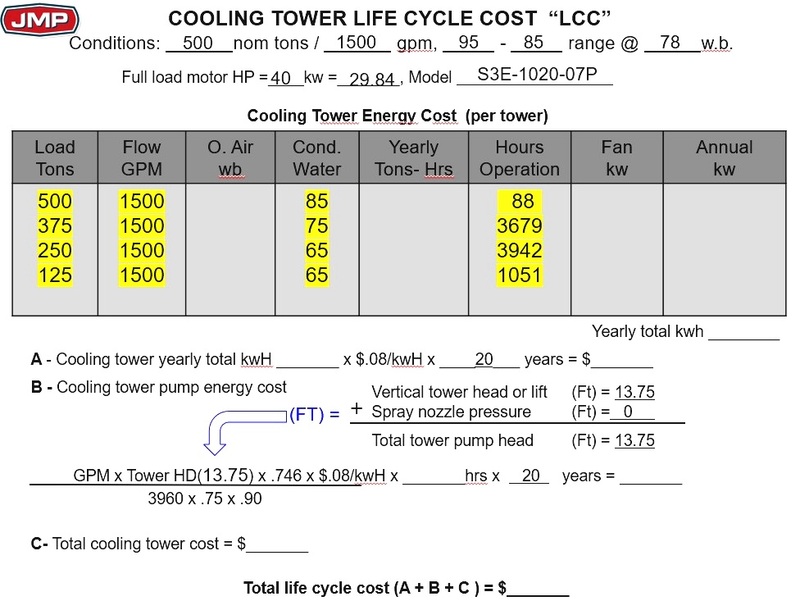 Creating a reasonable load profile is essential for calculating and then comparing lifecycle costs of specific cooling towers, including various brands and/or models within a specific brand. To do that we have to estimate the number of hours a cooling tower will operate at various load conditions. If you do not have the specific load profile for the area in which the system you are designing will be installed, we strongly suggest you use these numbers. After all, if the chiller is operating, then the cooling tower is operating, right? And using the IPLV is less cumbersome than looking up BIN hours. This will allow you to estimate and fairly compare the lifecycle costs of equipment. Based on all of the above, we now have a lot more information that we can now add into our life-cycle cost worksheet. Next up we will look into deriving those outdoor wet bulb values with a quick and not too painful review of the psychrometric chart.